Li-ion BMS module Front View. Each module 24V/10A max. power output. Li-ion BMS module rear View. 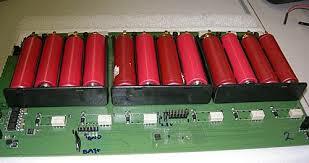 Each battery module could read out voltage,current,temperature,SOC,output current. Charger build-in and have charge balance function. Wind power/Solar power BMS controller with MPPT function. Build-in Lead Acid battery charger 12v/24V. Also could read out battery voltage,current,temperature,SOC,output current. With PC utility could monitor BMS status.